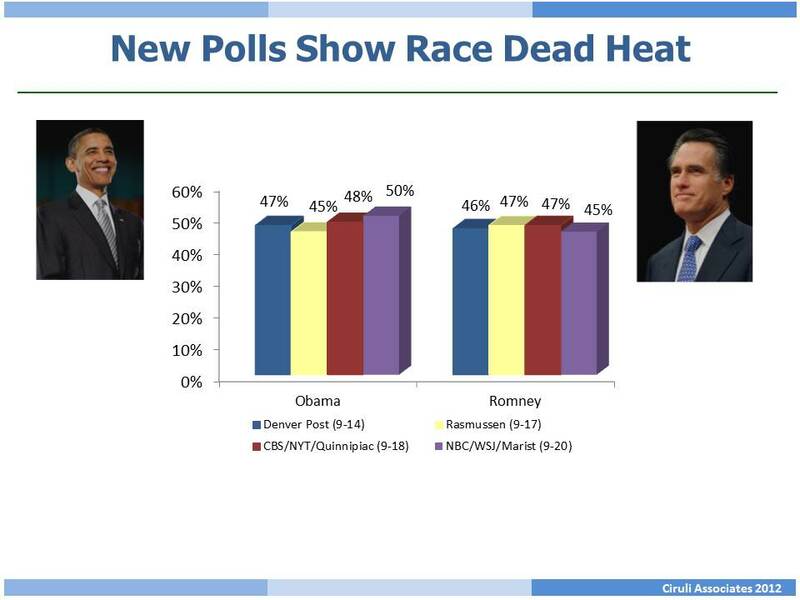 The Denver Postfinally weighed in with a September 14 automated poll that reported Barack Obama is up by one point in Colorado. The Internet has made it harder for local media to claim much news value on races receiving extensive national news and polling coverage. For example, on September 17, Rasmussen in one of his automated polls reports Mitt Romney ahead by two points. And, a day later, CBS/New YorkTimes/Quinnipiac polling partnership agreed with the Post and placed Obama ahead one point. On Thursday, September 20, NBC News/WallStreet Journal/Marist consortium weighed in with a 50 percent to 45 percent result for Obama. If that represented opinion movement, or margin of error difference, with the preceding polls will evolve, it produces a modest two percent arithmetic average for Obama in Colorado. But, at the moment, Mitt Romney is no doubt pleased the race appears tight. Obama had been up three points or more in most August and early September polls. Also, numerous polls in other toss-up states currently show him losing most of them, some not even close. Many national polls and much commentary appear to be moving toward Obama. The latest Wall Street Journal/NBC News poll has Obama up five points (9-16). It joins Fox (9-11) and CBS News/New York Times (9-14) that have shown Obama ahead five and three points, respectively, in the last week. The biggest spread was offered by Pew – eight points (9-16). However, both Gallup and Rasmussen daily tracking polls have kept the race closer (Gallup: Obama – tie (9-19); Rasmussen: Romney – 1 point (9-20)). Could Johnson be a Spoiler in Colorado? Obama Has Youth Vote, But Do They Care?